Like everyone else in life, I've had my share of ups and downs. But when I turned 16 and went looking for my first summer job, the employment gods smiled wide upon me. Paul Frene, a carrot-haired, multi-freckled friend of mine, had recently been hired by Roth Theatres. He got me an interview (which I drove to - illegally - in my father's brand-new Mercedes SL Convertible - but that is another story). I was thrilled to have a real job - even if it was one that paid me $2.50 an hour - less than minimum wage even in the 1970s (I forget how they got away with that one!). The reason I mention all this is because my brother, John, also a Roth Theatre alumnus, recently emailed me the stolen embroidered patch that was originally sewn on the god-awful, blood-red, polyester blazers the ushers were made to wear. The logo made me smile and remember many things, but most importantly for this venue, it reminded me that I was fascinated with branding long before anyone even conceived that term. I remember staring at the Roth Theatre's logo, pondering the rationale of inverting the R and the E in Theatres (which I now know to be the British spelling of the word). I wondered if the italicized letters going up at a slant made the whole thing seem more positive and fun, and guessed that the reason they used the stars was to tie it all back to Hollywood. I don't think I would design the Roth Theatre's logo like this now, but I do think it stands up pretty well after 40 or 50 years. Perhaps you can thank Bob Mondello, the renowned NPR film critic, for this; he was in charge of Roth's advertising in the late 70s when I was but a lowly "candy girl," as we called them back in the day. 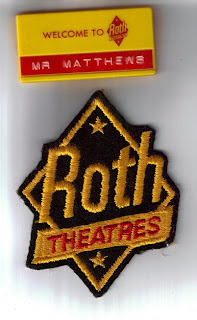 Roth Theatres has been defunct for many years now. Roth's Silver Spring East is now a bank on Thayer Avenue, and Roth's Silver Spring West, on Georgia Avenue not far from the DC line, is now a street-front church. 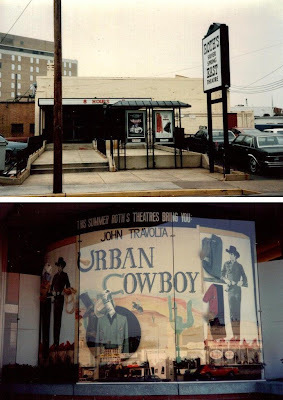 The West, as it was affectionately called, was originally a vaudeville theater that was converted to a movie house. As you can tell, I have wonderful memories of my theatre days. Besides working with my bratty, little brother, I met my first love there as well as my oldest friend, Bill Burgess, and sewed a passion for logo design that blossoms to this very day.